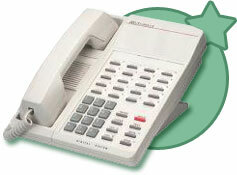 This Vodavi Starplus DHS Enhanced Key Telephone is fully equipped for hands-free speakerphone operation. Expanded to 28 buttons, 8 fixed and 20 user-programmable feature buttons. Equipped with dual color LED's that are pre-assigned default settings. Red and green LEDs make for a simpler user interface where the present call displays green and a busy line shows red. 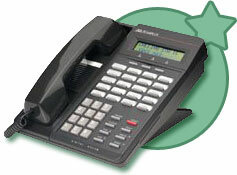 Flexible feature buttons and soft keys put sophisticated call processing at your fingertips. Starplus DHS telephone is available in your choice of Charcoal Gray and Off-White and are designed for communication effectiveness. Requires 1 station port. This Vodavi Starplus DHS Executive Key Telephone has a 2 row by 16 column (32 character) dot-matrix LCD display, with 3 interactive soft buttons. It is fully equipped for hands-free operation, 8 fixed buttons, 20 programmable feature buttons, plus 3 soft buttons, includes user guide, display speakerphone. The red and green LEDs make for a simpler user interface where the present call displays green and a busy line shows red. The features are easy to access through both the large LCD screen's interactive buttons and flexible feature buttons which can be programmed so you can customize your telephone to meet your needs. Requires 1 station port. Click here for a list of StarPlus DHS Phones products.